The cardigan can be made in 3 lengths but because I wanted it to go with the dress, which is quite full in the skirt, I chose the shorter boxy pattern. And then, of course, having a bit of 'thing' about peplum's and vintage patterns, it was a quick decision that I wanted to add this to the basic cardigan. These garments are all hand sewn and I am quite slow and careful with it. It has sort of hung around the sewing room for a few weeks and I work on it, in between other projects. I can't explain why I do not feel the need to charge at these projects and am convinced that they have strangely theraputic properties. Perhaps it is because a handmade item should be made with time and care, or perhaps I am just pretty terrified every step of the way! I love the feel and look of the felled seams and the embroidered bias binding on the neck and cuffs. It was super simple to put together and once the basic cardigan was made, I set about working on the appliqué frill. 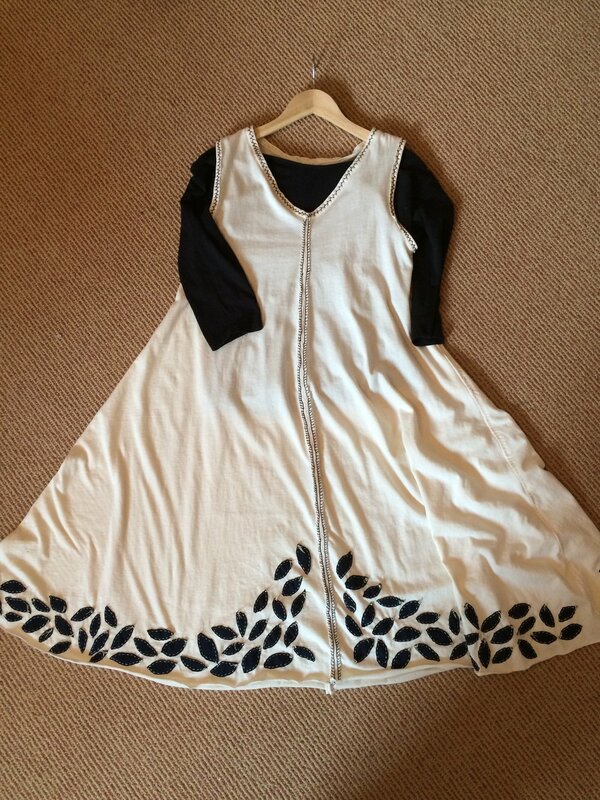 In book it is shown with a double layer reverse appliqué design, but I decided to just use the same idea as the dress and stay with the opposite colour way, so it is in navy jersey with cream embelishment' and the combination together with the dress is just fab! I found that if I cut about 10 leaves a day, I could just sit and hand appliqué them in the evenings and it didn't seem to take anytime at all. I arranged the leaves in a wavy pattern and I have to say that I wouldn't do this again - I didn't really take into account that once it was gathered the pattern would be lost and it would look a bit disjointed. It would have been better with a more linear approach. Of course, it doesn't really matter - the overall effect is very pretty and I know it is a bit quirky, but I do love the knots being on the outside. I smile sometimes when I look at it, because I am sure my Mum and Grandmother would think it that was awful, but the great thing about fashion today, is that you can challenge the normal ways of doing things and none cares at all and you can even be a tiny bit of a rebel along the way. When the frill was done, I did have some issues attaching it. It was heavy. Once it was gathered and with all that stitched applique it was rather bulking and the raw edge on the cardigan looked too light to support this weight. I tacked it in place and could see immediately that it was going to stretch and pull on the main body of the cardigan and didn't like it at all. It sat in the sewing room stewing and then it sat some more and finally, I asked a friend who is an expert in dressmaking and she said...stabilise the bottom edge of the cardigan first. I bought some navy bias binding and at this point, I confess, I did use the machine. Having stitched this on to the folded bottom edge, suddenly I had a lovely strong base on which to attach my frill. I was able to fix it on beautifully with this method and another friend advised me that because the frill was heavy, it would be better to use the sewing machine here too and to tack it on carefully and then feed it through the machine with the gathering on the underneath to avoid the machine foot rucking in the folds. It was done in minutes, which was a good job as I held my breath the entire time. It glided through the machine with remarkable ease and I love the way the raw edge shows along the top of the frill and I have to say that it swings and bobs around my 'curves' happily. It looks totally fab with jeans and I just know that I am going to get so much wear out of this project. I was never a fan to t-shirts or jersey clothes in general - Alabama Chanin has completely changed my mind on this and I think it is interesting the way these patterns develop into something totally original and you won't have to worry about bumping into somebody with the same outfit for sure!!! I have decided to make the 'Swing Skirt' next and this time I am going to try Natalie Chanin's reverse appliqué technique using 2 layers of jersey fabric in different colours. I'll keep you posted! I think this ensemble would definitely fall into the category of Modern Bohemian...I just love that! We are going to Stratford Upon Avon this weekend to see a Shakespeare production - it is a real treat and now I have the perfect outfit. ps. I have a sign on the door to my sewing room.... I'm thinking that for once it might be justified! Lol!